Goodbye 2012 , Hello 2013! Here’s to an Uplifting and Uncomfortable New Year! I have a heart full of gratitude for those who have helped make 2012 such a wonderful year. Thank you. I have a son who is always reminding me to get out of my comfort zone and keep growing. I have friends and family, near and far, who support me when I take baby steps to create, learn and grow. Another reason for a grateful heart. As some of you know I have become a ukulele fan and preacher this past year. 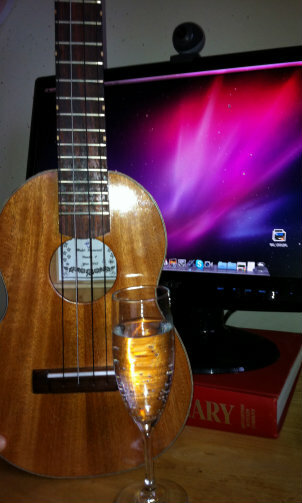 I’ve written about some of my uke journey with Banish the Blues with Dr. Uke and Ukulele Unleashes Unbridled Urges. So, guess what it unleashed? Songwriting! Here is the uncomfortable part – sharing it. Okay, I am totally out of my comfort zone here. I am toasting all of you who have helped me along the way and anyone getting ready to put your toes in the water of uncomfortable new learning or challenge. Here’s my gift and toast to you. It’s scary, but go for it! Happy New Year. PS. I’m working on writing a bridge section and more verses. Well I already have lots more verses, I am kind of going crazy with them : ). Do you have any to add?